Noting a phenomenon that might seem to recall a previous era, The New York Times Magazine recently portrayed women who leave their careers in order to become full-time mothers as “opting out.” But, are high-achieving professional women really choosing to abandon their careers in order to return home? This provocative study is the first to tackle this issue from the perspective of the women themselves. 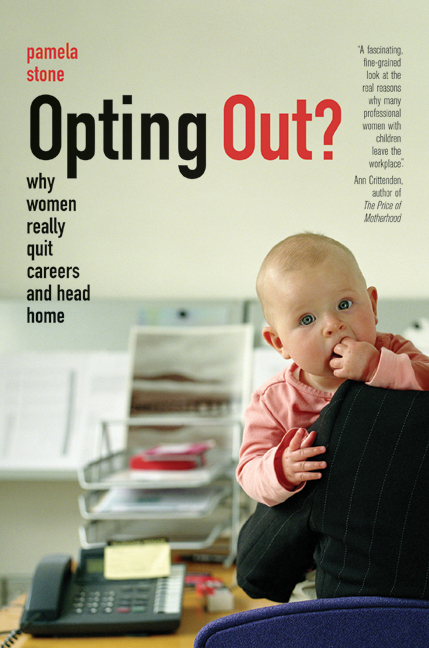 Based on a series of candid, in-depth interviews with women who returned home after working as doctors, lawyers, bankers, scientists, and other professions, Pamela Stone explores the role that their husbands, children, and coworkers play in their decision; how women’s efforts to construct new lives and new identities unfold once they are home; and where their aspirations and plans for the future lie. What we learn—contrary to many media perceptions—is that these high-flying women are not opting out but are instead being pushed out of the workplace. Drawing on their experiences, Stone outlines concrete ideas for redesigning workplaces to make it easier for women—and men—to attain their goal of living rewarding lives that combine both families and careers. Pamela Stone is Professor of Sociology at Hunter College and The Graduate Center, City University of New York.